It was a mad scramble to get their eight robots up and running before the start of the competition in Shenzhen, China, but a club of UW engineers say they're ready to do it all over again next year. 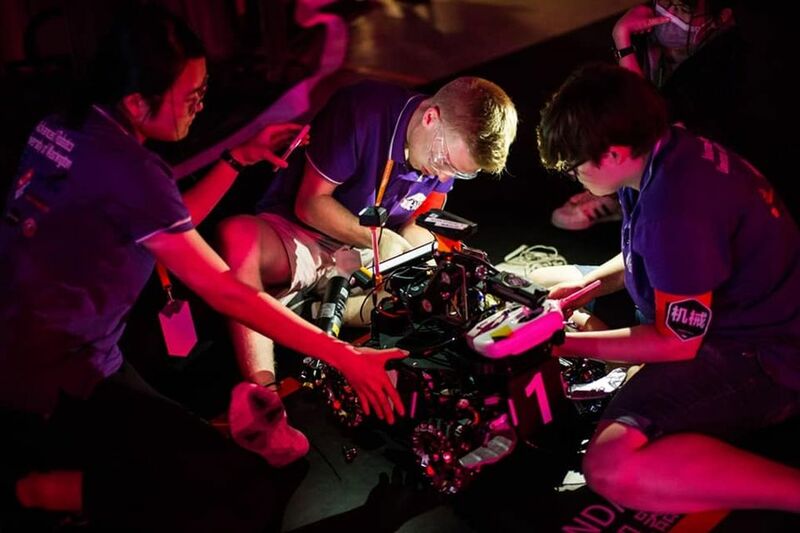 When they boarded a flight for China last month on their way to one of the world’s biggest student robotic tournaments, the University of Washington’s Advanced Robotics Club knew they were in for an adventure. They had no idea just how much of an adventure it would be. Lost hotel reservations. Damaged robots. Assembly challenges. Voltage issues. Overheating equipment. And some very well-funded rivals. 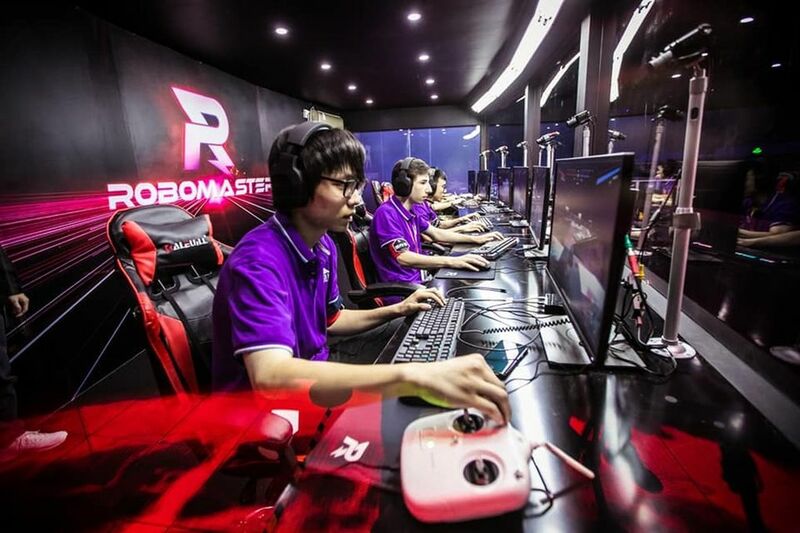 Still, although they only received a 3rd-place prize among international regional teams in the RoboMaster college robot challenge in Shenzhen, the UW club is making plans to return next year. The winning team was defending champion South China University of Science & Technology, a well-funded school in Guangzhou. The club’s two dozen members landed in Shenzhen — commonly known as China’s Silicon Valley — in the wee hours of the morning, and discovered the hotel they’d booked had lost their reservations. They were forced to push their luggage and 23 cardboard boxes of robot parts through the streets of the city, to a different hotel. They spent the next week and a half assembling their robots, which they had disassembled for the flight. The team spread mats on the floors of their hotel rooms and spent up to 17 hours each day putting the machines together, pausing only for takeout meals ordered by the native Chinese speakers on the team. To make some modifications and fixes, they went shopping in Shenzhen’s giant electronics markets — like the biggest open market you’ve ever seen, but solely for electronics — and bargained for parts. They bought a voltage converter to run an air compressor they’d brought from Seattle, but the converter kept overheating, so for hours they kept it running by blowing cool air on it with a hotel hair dryer. “It was a scramble to the finish,” said Jeremy Moon, the club’s executive director. The tournament is based on video-game culture and eSports, a form of competitive gaming that often uses a multiplayer online battle arena. During the tournament, the UW team’s eight robots — including three “soldier” robots, the drone and a “hero” robot that fires golf balls at a furious speed — battled another team’s robots in an obstacle-filled arena. 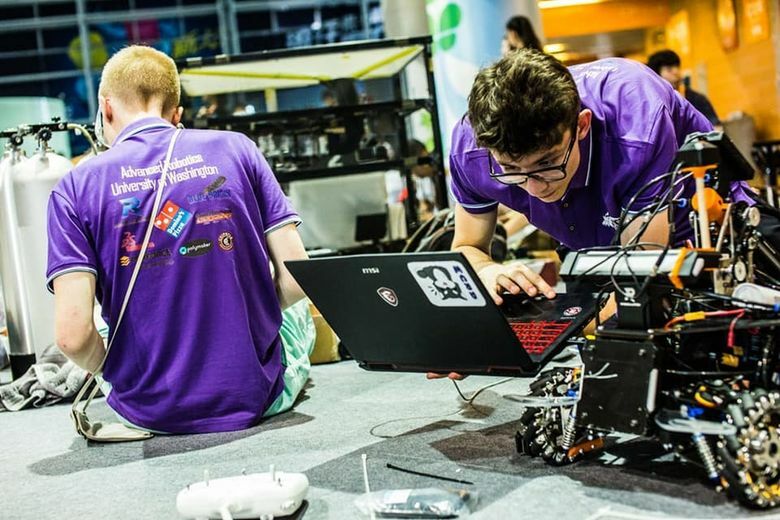 After each match, team members had to fix their damaged robots with spare parts, zip ties and duct tape, said Eric De Winter, the team’s president. The competition’s officials spent an hour before each match inspecting the robots to make sure they met safety specifications outlined in a rule book that runs nearly 100 pages. It is meant to ensure the safety of both people and robots, De Winter said, but also to simulate what it’s like to work as an employed engineer for a company. Engineered products must meet strict specifications, and “in the real world, if you don’t meet those, you have not developed a product you can put on the market,” he said. The tournament is sponsored by the Chinese company DJI, the world’s largest manufacturer of civilian and commercial drones, and the club was given a DJI-made drone that it modified with a turret to shoot pellets. That modification is illegal in the U.S., so the club was not able to test it until they arrived in China. While the tournament involves warlike elements, students say their robots pose no risk as weapons — they have the power, roughly speaking, of a paintball gun. Because of the way they’re designed, they also couldn’t be scaled up to become weapons. Club members say participating in a competition like this allows engineering students to not only practice hands-on skills, but also develop leadership skills and work through such practical issues as supply chain decisions for the robot parts: when and where to buy certain components, and how to budget. In effect, De Winter became the president of a small engineering company, said team member Sig Johnson. “You don’t get that experience as an intern,” he said. Advances in such things as 3D printers have made it easier to engineer custom robot designs. In the weeks leading up to the competition, Durr spent countless hours using the UW’s 3D printers to make component parts. At one point, she recalled, she had projects running on all 11 printers in one of the UW’s student-oriented maker spaces. And finally, the club members said it was instructive to go through the pits — where the robots are prepped and repaired — to see how other students from across the globe solved the same engineering problems.